Pontiac. Mansfield. Spring Hill. Orion Township. All these places once thrived in the shadow of General Motors plants. But now their futures - and their very identities - are in doubt with the automaker's decision to file for bankruptcy and shut down more than a dozen factories. The closings will cause "a ripple effect, and eventually it's going to ripple ... all over this country," said the Rev. Robert Knox, 53, who worked for GM for 31 years before taking a buyout in 2006. He's now an associate minister at a Baptist church in Pontiac, Mich., where GM will close an assembly plant. "This city's been affected for years because of plants closing and people moving out, and this is going to affect it more," he said. General Motors Corp., the once-mighty car giant whose plants were the lifeblood of many American communities, filed its Chapter 11 petition Monday in New York. It was the fourth-largest bankruptcy in U.S. history and the largest for an industrial company. 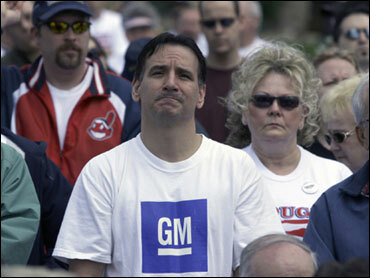 GM also revealed Monday that it will permanently close nine more plants and idle three others. "'Why us?' was my first feeling,'" Don Skidmore, an employee at a closing plant told CBS News correspondent Dean Reynolds. "I really thought with the quality of our plant that it would stay open," Beth Morrow, another worker at the plant told Reynolds. Worker Creon Mattison put it simply: "I hate us closing. I love my job." Some of the towns most threatened by GM's woes would not exist without the automaker. In Spring Hill, Tenn., where an entire community sprouted around the Saturn factory, the plant won't close, but its 2,500 workers will be idled indefinitely, Reynolds reports. The company has been part of everyday life by contributing to orchestras, community colleges and ballparks. "It's going to impact in a lot of ways we're not even thinking about," said Skip Allman, executive director the United Way of Richland County, home to an Ohio stamping plant slated to close. Workers at the plant near Mansfield, Ohio, contributed $200,000 to the United Way a year ago. If that money disappears, some programs could be in jeopardy, including a system for helping soldiers return from overseas if a family member is dying and another program that provides student tutoring. "It will be horrible," he said. "We're just praying for a miracle." In nearby Ontario, Ohio, a GM stamping plant that opened in 1956 created an entire community. Once a sleepy village of 700 people, the town grew to 5,500 residents and established a shopping mall, restaurants and one of the best school districts in the state. "General Motors set the stage," said Ontario Mayor Ken Bender. "It is the catalyst." Job losses at the 1,200-worker plant in the last year forced the city to cut its budget by about 20 percent. The closing of the plant is likely to force some layoffs, including at the police department, Bender said. In Pontiac, 27.3 percent of residents live below the poverty line, compared with 13.3 percent nationally, according to the Census Bureau. In March, Michigan Gov. Jennifer Granholm appointed an emergency manager to take over the city's finances after local officials were unable to resolve budget problems including a deficit approaching $12 million. As GM has become smaller, so has its contribution to the Lighthouse of Oakland County, a nonprofit that provides affordable housing, homeowner assistance and other services. The charity expects corporate support to decline as much 30 percent this year, primarily because of the dwindling fortunes at GM, Chrysler LLC and Ford Motor Co. Suppliers have been slammed as well. A successful reorganization at GM can't happen fast enough for supplier Mike Aznavorian of Clips and Clamps Industries, which has been whipsawed with shrinking orders from both GM and Chrysler. "We're expecting to be down 75 percent from our normal sales last year," Aznavorian told Reynolds. In the last year, the work day at Clips and Clamps has been cut in half. The number of workers has dropped from 60 to 20 and those left have had their pay cut by 20 percent. Aznavorian says letting people go was traumatic but inevitable. "When we laid these people off, I want to tell you, not one of them argued. Not one of them thought it was just horrendous that we were doing that," Aznavorian said. Local businesses also are feeling squeezed. "I think I'm going to cut down on my employees, downsize everything and try to survive," said Carolyn Arafat, whose family-owned business has sold food to GM workers in Pontiac for two decades and cashed their checks. It's near the assembly plant set to close by October. With cuts at local plants in recent years, M&K Liquor makes about 15 percent of what it once did, "and now I'm going to lose that 15 percent," she said. Sam Bazzi, 64, owns a Detroit tailoring shop that gets most of its business from GM employees and others who work with the automaker at its downtown headquarters. If GM were to leave, he would be forced to close as well. "Because no business, nobody, no traffic. If GM moves out, I don't have a choice." Delores Jackson, 47, who works at GM's Orion Township plant north of Detroit has logged 24 years with the automaker. She's keeping calm and relying on her faith as her assembly plant prepares to be idled by September. "You know what? Everything is on the bubble," she said. "So I just take it one day at a time, and I trust the Lord. He put me here. He knew everything that was going to happen when he sent me here, so that's where my trust is at." GM also said it will idle its assembly plant and its 2,500 workers in Spring Hill, Tenn., where car production began in 1990 with the Saturn - GM's attempt to compete with small Japanese cars. The factory made more than 3.7 million vehicles for the Saturn brand until 2007, when it shut down to retool to make the Chevrolet Traverse SUV. About 600 employees will remain at Spring Hill, doing stamping, working with polymers and making service parts. Union officials say the Spring Hill facility is also in the running to build a next-generation small car. "I am concerned for the well-being of all the employees at Spring Hill. I'm concerned about Maury County in general. How will this affect our revenue stream, which is already down $100 million this past month? It's got to hurt," said state Sen. Bill Ketron, a Republican whose district includes Spring Hill. James Kendall is president of a United Auto Workers local that represents a metal-stamping plant in Indianapolis. The factory had been set to close in December 2011, but Kendall said GM told union officials Monday that the plant could close sooner. Kendall said the local's members have agreed to significant contract concessions in a bid to keep the plant, which employs about 800 people. "The people here deserve this facility to stay open, but unfortunately it's not up to us." Mike Dersa, general manager of a GM dealership outside Detroit was actually relieved by GM's bankruptcy filing. "We're relieved obviously because General Motors is still here," Dersa told Reynolds. Dersa's dealership will survive in the new GM world - unlike the 2,600 GM dealers who won't. And he sounds as optimistic as a car salesman can be these days. Yes we're in bankruptcy. Yes we will come out of this a lot stronger and it's going to be a very short amount of time," Dersa said.